Q. Given your discretion, we would like to know something about the man behind the title. What is your background? I have been employed as a diplomat for the Ministry of Foreign Affairs (MFA) of the Republic of Azerbaijan since 1994. 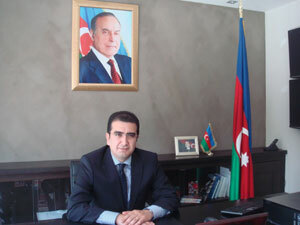 Having worked in various departments and positions at the MFA, and succeeded through all existing levels of diplomatic service, in July 2001 I was appointed as counsellor to the Permanent Mission of the Republic of Azerbaijan to the United Nations Office and other international organizations in Geneva. For the first three years, I was chargé d’affaires a.i. In 2004, I became the Deputy/Acting Head of the Department of International Law and Treaties of the Azerbaijani Ministry of Foreign Affairs and in January 2005 I was appointed the Head of that same department. In January 2010, the President of the Republic of Azerbaijan awarded me the diplomatic rank of Ambassador Extraordinary and Plenipotentiary. From January 2010 until April 2012, I worked as Ambassador of Azerbaijan to the Swiss Confederation; during much of the same period, I was also Ambassador to Liechtenstein. Also since January 2010 and until the present, I am the Ambassador of Azerbaijan to the United Nations Office and other international organizations in Geneva. 2. Your country has gone through tremendous changes since the restoration of its independence. What do you consider as the most important changes? The time frame since the restoration of our independence has been an important period of dynamic socio-economic development, a stage of democratic and modern state-building in Azerbaijan. Under the wise political guidance of our National Leader, Heydar Aliyev, we have made great strides in maintaining public and political stability, laying the foundations of the economy and securing strong popular support. Numerous state programmes outlining both the general directions of the country’s development and the specific work to be done in all areas have been adopted and successfully implemented. These activities have had an important impact on the socio-economic development of the country, improving the well-being of the population and facilitating the solution of other problems facing our citizens. In this regard, I would particularly like to stress that this policy and vision of our National Leader are fully followed and pursued by the President of the Republic of Azerbaijan, H.E. Mr. Ilham Aliyev. The launching of Azerbaijan’s oil strategy has opened up extensive opportunities for the implementation of all our future plans. The commissioning of the Baku-Tbilisi-Ceyhan oil pipeline in 2006 and of the Baku-Tbilisi-Erzurum gas pipeline a little later, and the renewal and diversification of the Caspian hydrocarbon export infrastructure has ensured the direct supply of Azerbaijani oil and gas to global markets. These events have become landmarks not only of recent years but also for Azerbaijani independence in general. We have tripled the size and diversified our economy, created a modern social and economic infrastructure, while securing the dynamic development of the non-oil sector. In 2003, our state budget was US$1.5 billion, while in 2013 we have increased it to US$25 billion. During the last decade Azerbaijan has made tangible progress in terms of the Millennium Development Goals through reducing poverty from 49% to less than 6% of the population and creating more than 1 million new jobs, at the same time as tripling its GDP so as to be ranked thirty-ninth among 148 countries in the Global Competitiveness Index 2013‒2014 issued by the World Economic Forum. Azerbaijan is currently the leading country of our region from the standpoint of its economic potential, accounting for more than 80% of the economy in the South Caucasus region. The world’s leading economic and financial institutions are currently giving a positive assessment of Azerbaijan’s successes, ranking the country in leading positions in major international reports. While the world’s leading rating agencies, such as Fitch, Moody’s and Standard and Poor’s, have downgraded the credit ratings of many developed countries, our rating has been upgraded. Azerbaijan has advanced into the category of countries with “high human development” in a report by the United Nations Development Programme. The “Global Competitiveness Report 2012-2013” of the World Economic Forum rates Azerbaijan as forty-sixth country in the world and first in the CIS. The list of our recent achievements is quite extensive. It is noteworthy to mention that, in 2011, Azerbaijan was elected as a non-permanent member of the United Nations Security Council (UNSC) for the first time in its history in the face of tough competition. In May 2012 and in October 2013, our country presided over that very organization. I think that this is the outcome of an international assessment of our country’s sustainable development in the years since independence ‒‒ an indicator of the respect Azerbaijan has earned globally and recognition of our contribution to global security. Despite the fact that Azerbaijan will have completed its membership of the UNSC in December 2013, these two years have been an outstanding experience for Azerbaijani diplomacy. In 2012 Azerbaijan started the process of paying compensation for the deposits left in the Soviet savings bank. It is worth mentioning that Azerbaijan is the only country of the former USSR to repay these deposits in such a short period of time and with a high interest rate. Azerbaijan has also won Europe’s top music competition, the “Eurovision” song contest in 2011, while in the following year we successfully hosted this competition in Baku, thus demonstrating our great potential to the world for holding this type of event. On 8 February 2013 Azerbaijan launched its first artificial telecommunications satellite into orbit. This was a very significant day ‒‒ a historic day ‒‒ and a major achievement for our country. The results we have achieved show that Azerbaijan is indeed developing rapidly and comprehensively today and that we are already a member of the “space club”. Two more satellites will be launched in 2015 and 2016, which will create excellent opportunities for the development of the space industry in Azerbaijan. The development of new technologies, in particular the ICT sector, has become a hallmark of Azerbaijan today and will facilitate our successful development in the future. In addition to that, the decision of the European Olympic Committee to conduct the inaugural 2015 European Olympic Games in Azerbaijan is not only a historic achievement and a huge success for our country; it is also evidence of Azerbaijan’s growing international authority and recognition of our extensive infrastructure on the part of the international community. Q. Your Mission is very active within international Geneva. What are your main centres of interest? Every year we take part in numerous sessions and meetings of the international organizations based in Geneva and, when necessary, provide our views and inputs to them. In that regard, I would like particularly to mention the Human Rights Council and the Office of the High Commissioner for Human Rights. Azerbaijan was one of the founding members of the Human Rights Council. Within that body we present our own initiatives and also support others through co-sponsoring the resolutions of interest. In this body, we pay special attention to the protection of cultural rights and property, the promotion of inter-religious and inter-cultural tolerance and understating, and the protection of internally displaced persons. As a young and independent country, we see the great opportunities here in Geneva for promoting the culture and life of Azerbaijan within the international community. International Geneva provides vast potential for making my country known to an international audience. The relevance and importance of the Geneva-based international organizations should also be mentioned in that regard. This year our Permanent Mission was the leading organizer for the event called the International Day of Novruz held in the Palais des Nations. Furthermore, Azerbaijan participated in May 2013 in the collective exhibition entitled “The urban landscape in contemporary European painting” sponsored by the Council of Europe and also held in the United Nations Office in Geneva. In November 2013 we were involved in the UN Annual Bazaar with our national stand and contributed to the charity fund for children affected by the recent typhoon in the Philippines. In April 2014, in cooperation with the International Dialogue for Environmental Action campaign initiated by Mrs Leyla Aliyeva, the Vice-President of the Heydar Aliyev Foundation, the Mission will organize an exhibition at the United Nations Office in Geneva entitled “Children`s Eyes on Earth: International Youth Photo Exhibition”. This will be a landmark event to raise awareness about important environmental issues, as seen through eyes of the children. The exhibition will display the photographs by children all over the world on the themes “I Love Nature and I Fear Pollution”, sharing their experiences and helping promote an understanding of some of the challenges facing our planet. Taking this opportunity I would like to invite you and your staff, as well as the wider audience of Diva International to attend the opening ceremony and to visit the exhibition itself. 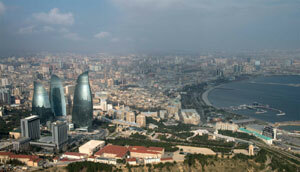 Q. Azerbaijan is already emerging as a donor country in the international arena. What is the rationale behind the foreign humanitarian assistance of your country and what are its main directions? The accomplishments that I mentioned above have enabled Azerbaijan to become an emerging donor country and contribute to the sustainable development efforts of countries in Africa, Asia and Latin America. This is a totally new chapter in the history of Azerbaijan and its activities on the international arena. The Azerbaijan International Development Agency (AIDA) has already carried out various assistance programmes in more than twenty countries. The Heydar Aliyev Foundation has provided various humanitarian and social programmes in its turn. Furthermore, the Government of the Republic of Azerbaijan makes voluntary annual contributions to the international organizations based in Geneva, such as the Office of the High Commissioner for Human Rights, the Office of the High Commissioner for Refugees, the International Committee of the Red Cross, the UN Conference on Trade and Development, International Telecommunication Union and others. During the first years of independence we faced a great deal of suffering as a result of armed aggression by the Republic of Armenia, accompanied by the flow of more than 1 million Azerbaijani internally displaced persons and refugees. During those years we were considerably assisted by the United Nations and its specialized agencies. If there had been no aid from the international community at that time, a humanitarian disaster in Azerbaijan would have been inevitable. However, today, thanks to the growing economic potential and achievements of Azerbaijan, problems faced by IDPs and refugees are fully addressed by our Government. As an emerging donor country, we fully understand the importance of international humanitarian assistance and our efforts in that regard are an expression of our sincere gratitude towards the international community. As a donor country Azerbaijan also possesses considerable knowledge and experience in the prevention of emergency situations and disaster risk reduction. In that regard, we are fully aware of the need to share this knowledge and experience with other needy members of the international community. 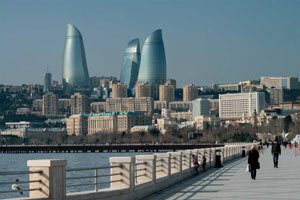 Q. Azerbaijan is becoming major player in the energy security of Europe. What is your assessment of the energy policy of your country? Over recent years, Azerbaijan managed to ensure its energy security and eliminate its dependence on foreign energy sources. Currently, Azerbaijan is a country contributing to the energy security of both the region and Europe at large and an important player in the global energy market. Azerbaijan’s share of the gas market in several European countries has increased to 40%. In addition to substantial oil and gas reserves, Azerbaijan has a pivotal position on the crossroads of Europe, Asia and the Middle East. Geographically, Azerbaijan is uniquely situated to serve as a regional transportation hub and to meet Europe’s energy needs. Energy exports and sustainable development offer ample opportunities for international cooperation. Our landmark Baku-Tbilisi-Ceyhan (Turkish port on the Mediterranean) pipeline ships around a million barrels of oil per day to the Eastern Mediterranean. Having transformed itself from a gas-consuming to a gas-producing country, Azerbaijan is increasing its contribution to European energy security. The arrival of gas from Azerbaijan will further diversify energy supplies for our European partners. The multinational Shah Deniz consortium recently announced its selection of the Trans-Adriatic Pipeline (TAP) to transport Azerbaijani natural gas from the Trans-Anatolian pipeline (TANAP) into Europe. These two new projects are pursued to increase gas supplies to European markets. Moreover, by offering thousands of new jobs and attracting large amounts of foreign direct investments, TAP will also have a positive impact on the socio-economic development of European countries. After the implementation of the TANAP project, which was initiated by Azerbaijan and is being realized jointly with Turkey, Azerbaijan’s role in the natural gas market of Europe will increase further. This project is expected to become a major contributor to our long-term development and will secure Azerbaijan’s economic and other interests for decades to come. Q. How do you see future prosperity as a whole for the South Caucasus? Pursuing peace with and among our neighbours, Azerbaijan seeks to avoid further suffering brought about by the ongoing conflict with Armenia, which has resulted in about 20% of Azerbaijan’s territory being occupied, followed by the ethnic cleansing of around 1 million indigenous Azerbaijani people from their native lands. It is not a coincidence that four United Nations Security Council (UNSC) resolutions clearly demanded the immediate, complete and unconditional withdrawal of Armenian forces from all occupied Azerbaijani territories. Unfortunately, the key UNSC demands have still not been implemented, and the mediation efforts carried out for more than twenty years within the framework of the Organization for Security and Cooperation in Europe have not yet yielded any results. We are confident that for the purposes of lasting peace, security and stability, there is no alternative other than to convince the Republic of Armenia to put an end to the illegal occupation of the internationally recognized territories of the Republic of Azerbaijan through the concerted efforts of the international community, to ensure that the inalienable rights of the Azerbaijani internally displaced persons to return to their places of origin is fully recognized and implemented.